"Until the age of nine I had nothing—just one ancient dress. I went hungry, ran around barefoot from April to October, even begged. We were a family of “Enemies of the People.” That was what they called those who had been accused of political crimes and sent to the camps. Three of my relatives had been accused of spying for the Japanese, and were executed. Later, my great-grandfather was assassinated in the middle of Moscow, pushed under a car. I didn’t have toys and had only one crayon, purple. I found a piece of cardboard and made a purple horse with a purple eye. It seemed too skinny, so I wrapped a rag around its middle and played with it. In the street, I always picked up bits of brick, limestone, and charcoal, and drew on the pavement with those three colors: red, white, and black." To appreciate the dark comedy of Ludmilla Petrushevskaya's novels and stories you don't have to get the humor embedded in the phrase 'Apocalypse pretty soon', but it doesn't hurt. There is an old Russian saying that goes: "I wake up; it's a bad day." Petrushevskaya must know this well; her stories are often described as fairy tales but not by her fellow Muscovites who see her as the chronicler of their daily lives. 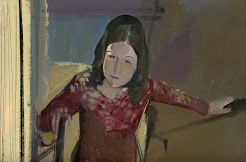 The girl Ludmilla who made a space for herself under a table in her demented uncle's apartment gave birth to the writer whose depictions of suffocating family life all but drives her characters crazy. The bleak living conditions in urban housing blocks, known as kommunalkas, have outlasted the Soviet regime that decreed the virtues that would result from communal living. All too predictably, scarce material goods and lack of privacy led to the fierce possessiveness that could bring relatives to argue over "ownership" of an electric light switch. Anna, the protagonist of "The Time Is Night" (1982), has to eke out the resources to care for her grandchildren, while her grown children circle like vultures, ready to grab whatever they can. In a more recent story, "Chocolates With Liqueur" from 2002, reminiscent of Edgar Allan Poe's "A Cask Of Amonttilado," a married couple is locked in a struggle to the death for possession of an apartment. 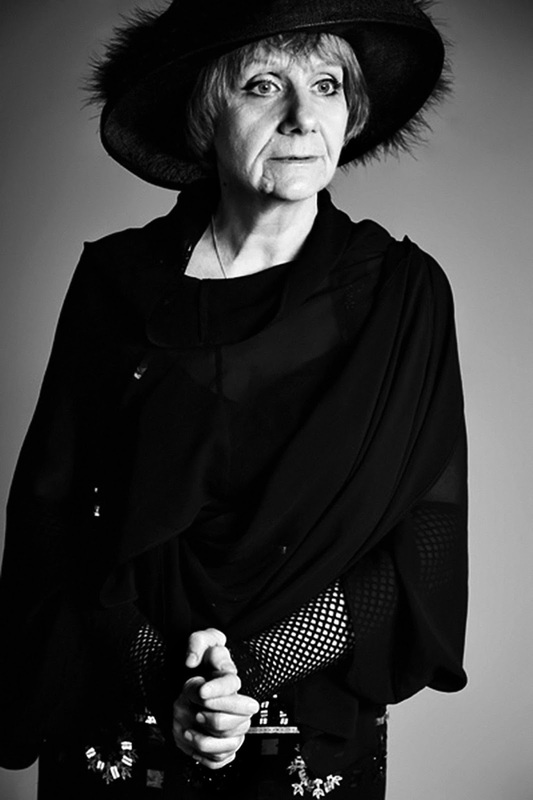 Petrushevskaya, who was born in Moscow in 1938, was widowed in her twenties, a young mother with a child to support. Soon she began writing and, although she had a few stories published during the next two decades, most were banned by the authorities. While her stories lay rejected in a desk drawer, Petrushevskaya staged them as plays at schools, factories, or anywhere there was an available room. When glasnost (the thaw) happened in 1988 and Immortal Love was published, Petrushevskaya was recognized as one of the finest living Russian writers. "Love them,­ they'll torture you; don't love them, ­they'll leave you anyway." There Once Lived a Mother Who Loved Her Children Until They Moved Back In by Ludmilla Petrushevskaya, translated by Anna Summers, New York, Penguin Books: 2015. 1. 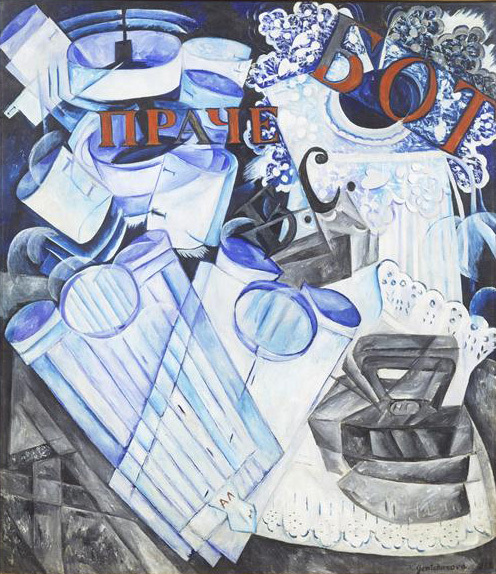 Natayla Goncharova - Linge de maison (Household Linens), 1913, tate gallery, London. 2. unidentified photographer - Ludmilla Petrushevskaya, courtesy of Penguin Press. This is grand to read on the same day I had an interesting talk with a Russian colleague. I attempted to congratulate her on some happy news I had heard. Her face became very serious and I had to answer a slew of questions including 'What happy news did you hear? and 'Who told you this happy news?' In hindsight, it was a funny conversation. But I think I understand it better now after reading your post, dear Jane! Rouchswalwe, I hope you also read "There Once Lived A Woman Who Loved Her Children Until They Moved Back In." The title alone made me buy the book, and I was not disappointed. I love things that pull me out of myself and enlarge the world - that's not elegantly put, but it's the best I can do. I think you'll know what I mean. I'll put the book on my "to-read" list forthwith, dear Jane! And yes, I know exactly what you mean ... Prost! Rouchswalwe, there is another Russian writer on the way. This one will be very different - from Siberia!